Ok, so I don´t really have a development kitchen and most of the actual experimentation went on in a small blue plastic bucket in my storage shed, but I have successfully cured (in brine) a piece of pork for the first time. You may recall a while back I showed you a recipe for Boiled Gammon. At the time I talked about the fact that it is impossible to buy it here in Andalucía but that I wanted to figure out how to make it at home. Well, I turned to my old pal Hugh Fearnley-Whittingstall and he had some great information in his River Cottage Cookbook. I started with a small piece of loin of pork that weighed 800g as I didn´t wanted to waste a large piece of meat if it all went horribly wrong. I decided to play around a little with the flavours, amounts are flexible. I boiled the salt with the beer and spices until it was dissolved then stirred in the molasses and added enough water to ensure the liquid would cover the meat. The pork was put into a new (and then sterilised) bucket and covered with the brine once it had cooled completely. I had to put a plate with a weight on it to keep it from floating out of the water. This was then left in a cool dark place for 3 days. The recipe suggests this as a minimum period per kilo with a four day maximum period per kilo. You should note that your meat will not be a pretty pink colour like the brined hams bought in shops unless you use something like saltpeter or a chemical additive to keep the colour. I didn´t do this, as I prefer not to. For me, it´s all about keeping it natural and tasting great. When the required number of days have passed, drain the meat (discard the brine, it should not be reused). Bring it to the boil in a pot of fresh water, drain it again and then cook. I cooked it in the same way as previously, this time adding a couple of dried chillis to the stock and some celery. When I posted the previous recipe my best friend called me to ask what the heck I had been doing serving the gammon with parsley sauce when it should have been onion sauce. I stand corrected. This time I made a delicious onion sauce by gently frying a medium onion in a little olive oil until it was soft and transparent. Then I added 2 tablespoons of flour and cooked it slightly then stirred in a cup of the meat cooking stock and half a cup of milk. Add salt if it needs it (mine didn´t) and pepper and serve alongside the meat and vegetables. Any leftovers can be made into a soup, but more of that another day…I´m off back to the Development Kitchen. We keep the wine in the shed. I enjoy making bread, and it´s always good to come across new recipes. When I saw JamieAnne´s recipe for Oatmeal Bread over on her blog, A Dash of Domestic, I had to give it a go. Finally, I made the dough in the morning. It was lovely to work with and became very smooth and silky quite quickly. It was a hot day so I dusted it with flour, slashed the top then covered it with a tea towel and left it in a sheltered but shady spot in the garden for two hours then baked. It even looked beautiful as it was rising! 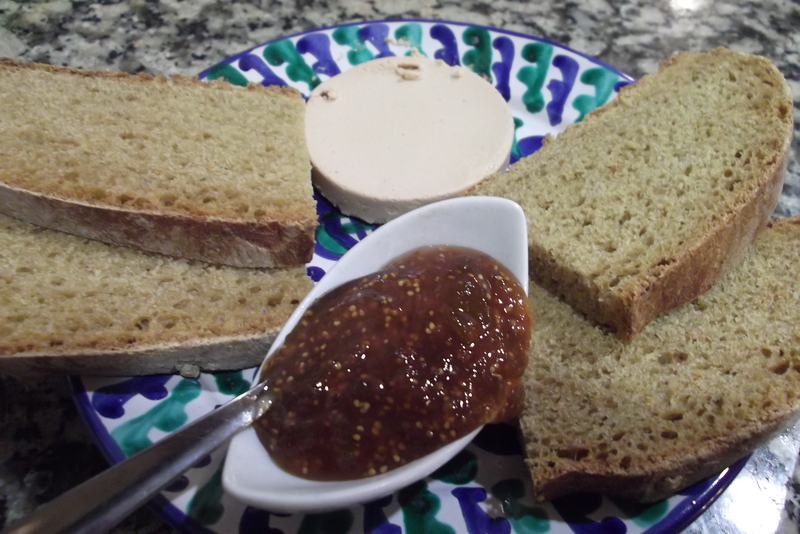 We enjoyed the slightly sweet taste which comes from the molasses and thought it worked well with salty cheese and also with paté and the last of my home made fig jam from last year. Thanks JamieAnne, will be making this one again! Having spent the day rushing around and generally being a busy bee, I wanted something quick and easy for a light supper. Leftovers from a chargrilled chicken dish made the night before included most of a chicken breast, so I decided to make some fritters and serve them with a big mixed salad. 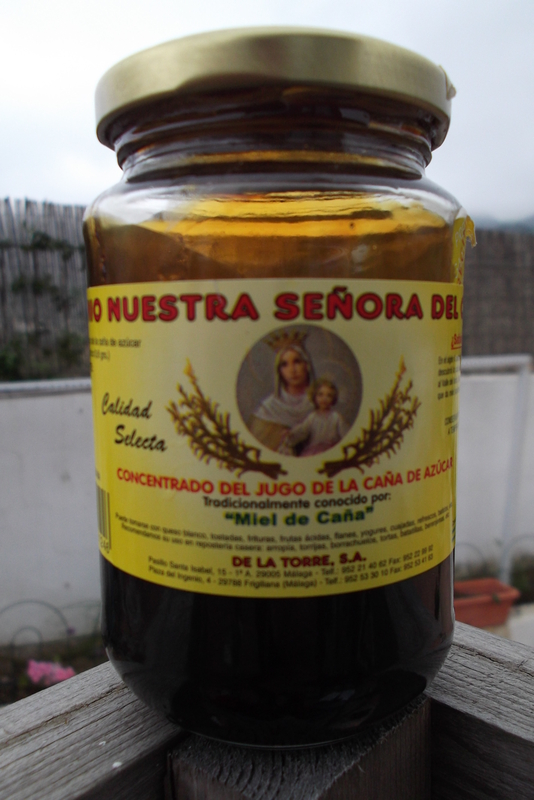 Here in Andalucía they often make fritters with salt cod (which has been soaked and desalted) and serve them with Molasses (or sugar cane honey as it´s called here) drizzled over. When I was first introduced to this concept, I wasn´t sure it was going to be for me. The idea of sweet and salty mixed together seemed strange, but then I thought about how in the UK we often eat meats with fruit sauces (pork with apple sauce, turkey with cranberry) and realised that it wasn´t such a weird idea. I´m so glad I did give it a go as it´s a fantastic combination and works really well with these fritters. If you just can´t face the thought of Molasses though, a sweet chilli dipping sauce or mayonnaise also tastes great with these little fritters. 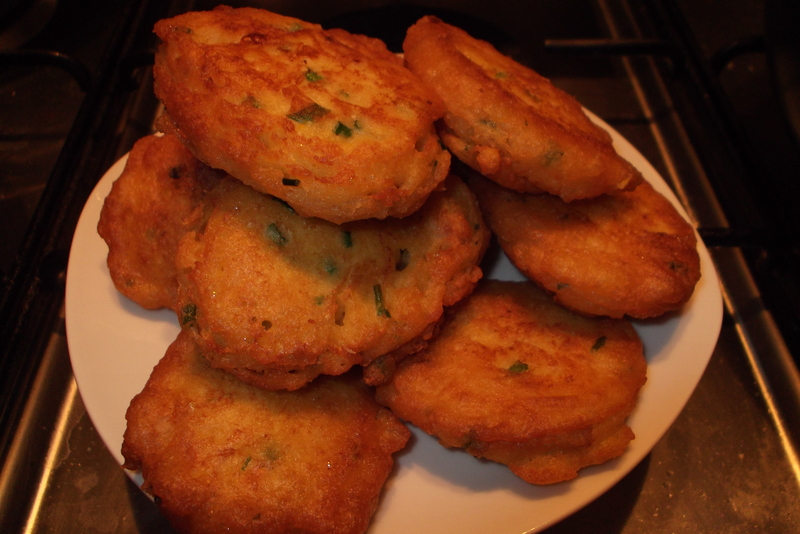 Ingredients used (which are approximate) made 14 fritters. In a bowl add the flour and egg to the sweetcorn and mix well. Gradually add the milk until you get a paste the consistency of a thick porridge. You may not use all the milk, or you may need a little more, it will depend on your flour. Add the chicken and chives and season to taste. Heat your oil in a deep frying pan and when ready, drop heaped tablespoons of the mixture in, flattening them out slightly with the back of the spoon. Each side will take about a minute to cook, remove, drain and serve. And if you´re feeling Spanish, you can call them Tortillitas de Pollo, Cebollina y Maiz. Olé!